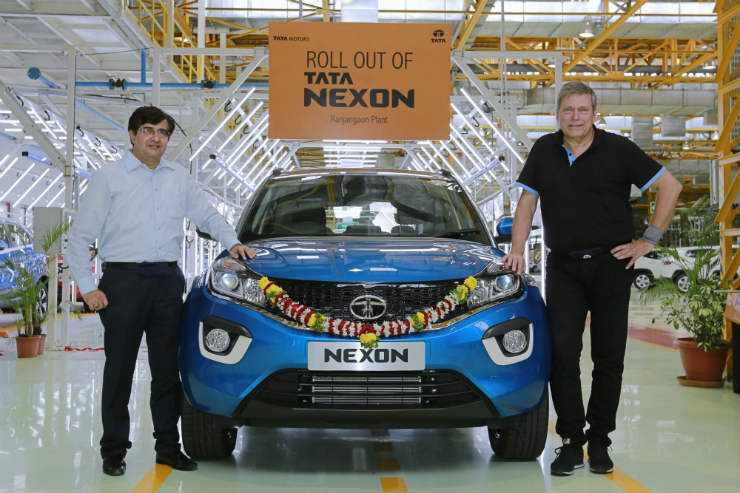 Tata Motors is ready with their next big launch – Nexon. The compact SUV has officially started to roll out of the company’s Ranjangoan plant. The Nexon is expected to launch around the festive season and it will be the brand’s first sub-4 metre SUV. The Nexon will compete against the likes of Maruti Brezza, Ford EcoSport. Tata earlier released the official engine specifications for the Nexon. The compact SUV will be powered by a 1.2-litre three-cylinder turbocharged Revotron petrol engine that generates a maximum power of 108 Bhp at 5,000 rpm and 170 Nm of peak torque between 2000 – 4000 rpm. The diesel engine unit is an all-new 1.5-litre engine that also generates a maximum power of 108 Bhp at 3,750 rpm and peak torque of 260 Nm between 1,500 – 2,750 rpm. Both the engines get 6-speed manual gearbox. Tata may launch automatic transmission at a later date. Tata Motors will soon start dispatching the model to dealerships across India in a phased manner. Tata may put the vehicle for display at showrooms for customers. There is no news about the pre-bookings of the vehicle yet but it may start soon. Tata is currently discontinuing a lot of old models to streamline the line. The brand, which is trying to change its image in the market will launch its fourth car on the IMPACT design philosophy after the Tiago, Tigor and the Hexa SUV. The Nexon carries a design principle from the Range Rover Evoque and looks well proportioned. The Nexon will be most powerful diesel compact SUV in India. The prices are expected to start at around Rs. 6 lakh. Tata will launch the compact SUV during the festive season.